Carroll, Noel, “Hans Richter’s Struggle for Film,” pp. 104-12. 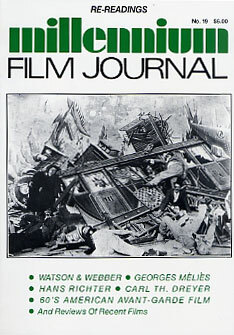 Fischer, Lucy, “The Films of James Sibley Watson, Jr., and Melville Webber: A Reconsideration,” pp. 40-49. Frazer, John, “Cubism and the Cinema of Georges Melies,” pp. 94-102. Hindle, Will, “Letter to Dominic Angerame,” pp. 8-11. Nadaner, Dan, “Metatourist in Metaworld: Patricia Gruben’s Sifted Evidence,” pp. 114-19. Noguez, Dominique, “Towards Irreference: American Avant-Garde Film of the Sixties From the Triumph of the Signified to the Rise of the Signifier,” pp. 22-37. Pipolo, Tony, “Metaphorical Structures in La Passion de Jeanne d’Arc,” pp. 52-84. Ridless, Robin, “Beyond the Real and the Imaginary: Chris Kraus’s How to Shoot a Crime and Other Films,” pp. 130-42. Stephenson, Rob, “Interview with Trinh T. Minh-ha,” pp. 122-29. Wees, William C., “Visual Perception, Medium Specificity, and the Metaphor of the Camera Eye,” pp. 12-21.